WELCOME TO CAPTAIN'S QUARTERS! Here you can sail, swim, kayak, fish and boat- all from your own dock & float. "CQ" is for anyone who loves the ocean! 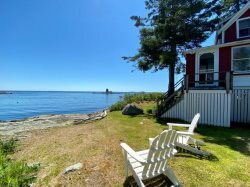 Located on the east side of Linekin Bay, just across from Cabbage Island, this comfortable three-story home in East Boothbay is the real deal. This house was featured in the made for PBS television series, Getting Away Together. We have a link to the episode's sizzle reel and more fun behind the scenes videos on our Youtube channel: Getting Away Together- Boothbay Harbor Region. This home was built in the late 1800's as an Inn for the Eastern Steamship company. It features a spectacular wrap-around porch on three sides with beautiful sunset views over Linekin Bay and Cabbage Island. People also love to gather in the kitchen which has an island in the middle and several bar stools for eating or just "gathering together" to cook and talk and enjoy time with each other. "I grew up in this area went away and came back and Jeff moved here with his family in 1977 as a summer resident. We met here, fell in love here, and got married here at the house. We love living here year-round. The Boothbay Region is so beautiful and full of quaint small towns with lots of history and charm! There is something for everyone! This area has a lot of local restaurants, no chain restaurants and also a few craft beer breweries. You can tour lighthouses, historical museums, shop, eat, sail on a schooner, paddle around the Bay in a kayak or visit the interesting and beautiful aquarium and botanical gardens. When you get tired you can come home and relax on this beautiful porch and enjoy the ever-changing weather and views of the Bay watching seals and sailboats. We love to spend our Sundays out on the boat fishing for mackerel and bring our catch home and cook it for dinner. We love to travel but we really love coming home to Boothbay! Beginning the day with coffee down on the dock and ending the day on the covered, screened glassed porch with a glass of wine or a favorite drink makes for the perfect day and night. In the evening, the cooks congregate in the kitchen, the kids like to play on the porch and the sports lovers like to watch the game in the living room. All the bedrooms are on the second and the third floor, so if you want to go to bed early you probably won’t hear the noise downstairs. The house is minutes from downtown. Our house is on Ocean Point, yet you feel like you're far away when you get home. There are so many things to love about this historic house. There is a lovely breeze off the Bay that makes for lovely cool nights and great sleeping! This house embodies the "Classic Maine" and the “Real Maine”. We believe we are merely the caretakers of this wonderful home and we love sharing it with others to enjoy it and create beautiful lasting memories with family and friends. This house has been a “home-away-from-home” to thousands of people over the years. And, the tradition continues." THE HOUSE: Overlooking Cabbage Island and Linekin Bay, Captain's Quarters is rich in history and began life as an Inn in service to the steamships traveling the coast of Maine and later became a Sea Captain's home. Come and see how the current Captain and his family have brought this gracious lady into a modern world without destroying the charm and character of the house. On the first floor, you will enjoy the well-equipped kitchen, formal dining room, large living room and 3/4 bathroom (shower). The large spacious kitchen is well equipped for preparing big meals with two coffee makers, two refrigerators, and an additional freezer plus an island for socializing, the kitchen is large enough for folks to ‘hang out’ while preparations are underway. The living room has a gorgeous fireplace and several furniture groupings offering plenty of space for conversations and indoor activities such as puzzles, board games, and WiFi. Mementos from the current owners as well as historic pieces from over a century of visitors, this cottage welcomes you to come right in and make your own memories! The second floor has one full bathroom and four bedrooms: The Lilac Room has a King bed, gracious lilac wallpaper, and soothing furnishings. This room is for morning people with views over the terrace and lawn. The Nautical Room has a Queen bed and just enough nautical touches to have you dreaming of adventures on the high seas. Lace curtains frame views of Linekin Bay and Cabbage Island. The Butterfly Room has Two Twin Beds. Hand-painted butterflies flitter about the walls of the room creating a soothing oasis of whimsical magic with beautiful touches adding to the charm. The Bird Room has One Single Bed and one Double Bed. Hand-painted art depicts life-size images of local birds and their habitat. Civil War era furniture and appointments add beauty to this incredible room. The third floor has one full bathroom and four bedrooms: The Garden Room, with two single beds, is complete with a white picket fence around the hand-painted garden circling the room. Little bunnies, birds, ladybugs and more make delightful roommates! The Harry Potter Room, with two Twin beds, is a wizard’s delight with all manner of secret magic paraphernalia. Should the need to look up a potion recipe arise, a set of the books is on hand! The Red, White & Blue Room, with two Twin beds, is replete with red and blue roses on the walls and carpet with white blankets making this room the perfect haven for the patriot in your group. The Soldier’s Room, with two Twin beds and tin soldiers marching wallpaper, will inspire child-hood nostalgia you will want to share with your grandkids! BEDROOMS: (1) King, (1) Queen, (2) Twins, (1) Double and (1) Single, (2) Twins, (2) Twins, (2) Twins, (2) Twins. BATHROOMS: (1) 3/4 Bathroom with shower, sink & toilet, (1) full bathroom with shower/tub combo, (1) full bathroom with shower/tub combo. The grounds cascade in tiers from above the house down to the water. Small vignettes of flowers, flowering bushes, and seating arrangements create beautiful gathering spots as well as private reading areas. Hummingbirds, butterflies, dragonflies are here throughout the entire season, as are many nesting birds. A gas BBQ and cook-out area with picnic tables are great for outdoor grilling and provide the perfect venue for an old-fashioned lobster bake. Croquet, horseshoes and badminton games are available. There is a swing set for small children! An enclosed porch wraps around three sides of the house with glass and screen windows letting in the sunshine, sea breezes, and amazing views! White wicker furniture with nautical-inspired cushions leads from one seating arrangement to the next. Dining tables, a foosball and Ping-Pong table along with games, puzzles, a reading library and DVD’s will provide hours of endless entertainment. In the evening, warm lighting and salty air lend a festive ambiance for music, games, storytelling, and gathering together. Extending out into Linekin Bay, the low tide depth of the float is 10’. Bring your kayaks and boats. Sturdy Adirondack chairs on the dock are perfect for morning coffee or evening cocktails or just to enjoy the cool afternoon breezes. Be sure to bring your camera! Captain's Quarters looks directly out at Seal Rocks which at low tide is covered by sun-bathing seals. Osprey, eagles, loons, herons, cormorants, and seals are just some of the animals that frequent this diverse natural habitat. Swim, sunbathe or fish from the float. Two deep water moorings are also available, ask for details. Bring your own boat, or rent one. Boating in Maine requires that you read charts and be aware of the tide changes. In Maine, we have 9-foot tides. If you happen to be down at the dock and a lobsterman comes by to pull his traps, wave him in and you may be able to buy lobster right from the boat. WHAT ELSE WILL YOU NEED? Peruse our website for local vendors, eateries, and activities. Replete with all things vacation; if you can think of it, our site most likely covers it! Be sure to reach out to us if you need any help creating the perfect vacation! BOOTHBAY REGION and Boothbay Peninsula is a beautiful region rich in culture, history, all things nautical and of course it’s own unique niche in nature. The area offers ample opportunities for biking, kayaking, canoeing, fishing, charters, and guided cruises, spas, a championship golf course, and country club, mini-golf, bowling, museums, antique hunting, hiking and walking trails. We have the Maine State Aquarium, the Coastal Maine Botanical Gardens and the Boothbay Region Land Trust with its 30+ miles of pet-friendly trails in protected areas. For a more comprehensive list of local offerings Click Here! EAST BOOTHBAY is an area that stretches from Boothbay Harbor out to Ocean Point. There are several little seaside communities that are part of East Boothbay. Rich in boat building history, East Boothbay in renowned the world over for the shipyards of the region. With many seasonal seaside cottages and homes, there are a few brave souls who call East Boothbay home year-round! Restaurants include Lobsterman’s Wharf, Ocean Point Inn, and East Boothbay General Store. A full- service Marina is located behind the Post Office. Great walking trails and of course incredible ocean views abound in this unique part of the Boothbay Peninsula. Linen – Linens are provided at no additional cost (includes pillows, blankets, pillowcases, sheets, bathroom towels, bathmat(S), and kitchen towel. The team was always more than willing to answer all questions both about the house and the surrounding area. We had rented the house 2 previous times so we were already familiar with most things. I asked for a photographer to come to the house and Pamela was kind enough to recommend Karin, who was simply wonderful and spent lots of time with our family getting what I am sure will be memorable shots of our large family. We don't have the photos as of yet but I know they will be amazing. Amazing as always!!!!!! Our collective families love Captain's Quarters and the surrounding area. We traveled from Tennessee, California, Georgia and Indiana to spend time together in a very special place!!!!! The team is very responsive. Audrey is awesome. We couldn't have had a better family vacation experience. The house suited us perfectly. We were a family of 10, ages 15 to 87. Captains Quarters had something for each of us. We loved the view and never got tired of it. Some of us biked, some of us hiked, some of us relaxed on the dock. Each evening we played games or did a fun craft. We kayacked, played ball, had a cookout one day. Loved cabbage island excursion and all the neat restaurants we visited. Loved downtown Boothbay! All in all a fabulous family vacation! Thank you Cottage connection! They were very nice and informative during check-in. Cottage Connections and the homeowners made our vacation stress free. Any suggestions for future guests? Relax! Yo're in great hands! We had a wonderful time. The house has 8 generously sized bedrooms. Plenty to do in the area. Loved the big porch for our family gatherings, entertainment and meals. The big yard was a Hugh plus for us. The ages of our family ranged from 3-70 years of age and the house and grounds suited all ages. A large family vacation with family coming from 5 states. Shopping, kayaking, swimming, tours, meals out, visiting with family, and TOTALLY relaxing. we enjoyed it--it was perfect and just what we anticipated. We chose Cottage Connection because they had the size house and mooring requirements we needed. The best part of our rental experience was lots of space for 11 people! We worked with Cottage Connection because they had a large enough house to accommodate our family. Your staff were wonderful and we had relatives in another rental and you were great to them. Everything was in order and we all had plenty of room inside and out. The house was awesome and accommodated everyone so well - LOTS of space - even when it rained. It was so nice at how happy and please everyone in our group was with house and its location. Driving Directions & Check-In Instructions will be sent to the guest, via e-mail, TWO WEEKS prior to their scheduled arrival date. Type of Waterfront: Dock & Float. Bays are usually recessed areas in the coastline that opens directly into the ocean. Linekin Bay empties into the Atlantic Ocean. Swimming Area Rating 1/5: Swimming off dock only due to a seawall or rocky/wooded shoreline, the owner has provided a swim ladder to make getting in and out of the water easier.